The car show season is upon us. Good thing I was able to catch the last day (yesterday, April 5) of “MIAS” 2009. I was there in 2007, but last year, I don’t remember (and can’t believe) how it passed me. Anyway, MIAS is not a Trans Sport Show – tuner and custom car-wise, which means majority of the displays are latest offerings from manufacturers, although there were still a lot of cool “customs.” After all, they need to pack the World Trade Center. What I really want to see however, is a Trans Sport Show-type show held there (WTC). The World Trade Center is just perfect for such. Imagine a full week’s worth of cars, activities outdoors (e.g. Russ Swift’s demonstration, competitions), food, honeyz (naks), the whole shebang. 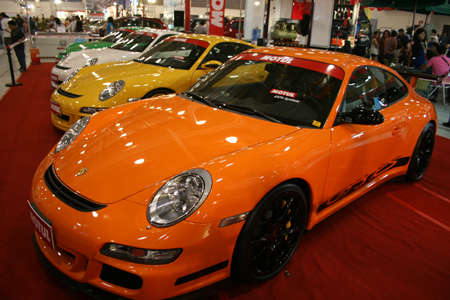 Someone please create the perfect Philippine car show. The photos will tell the story. I was only able to take photos of 2 promo girls. Damn it. I encountered a small hassle issue with the kumander, plus, it was almost closing, so less girls. I did however take photos of all the motorcycles there (haha) – my new “thing.” Click below.